Ahh, those pesky bunnies. We had the same problem. OH made a lean to wooden infill, like a continuation of the kick boards, which clips into place across the gateway. It's made of a backing frame fronted with tongue and groove boards. It's light enough for me to be able to move it singlehandedly, it has a plaited baler twine grab handle. The arena is kept boarded up unless it is in use, when I prop the infill up in the corner. 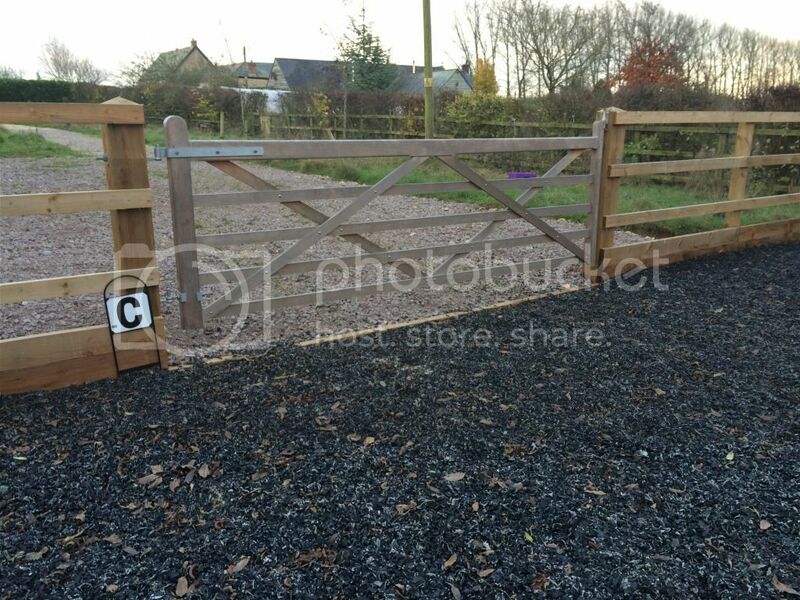 You can still open the gate outwards whilst it is place, but not inwards. Our kickboards are taller than yours, though (4 boards high) as we have a leaning fence design. We have foxes who dig holes in our arenas! I had something similar and TBH most of the time we just stepped over the board to get in and out but we could lift it out if we wanted. I also used plaited baling twine but I couldn't easily move mine on my own. So do we, I often find half buried remains, we also get rabbits and squirrels, however the mole gave up! So have I, I just fill the holes up on a regular basis as one they hit the membrane, they give up.